Thistle Hill Tavern has a peculiar back-story. This restaurant initially launched in 2010 with a press release heralding the involvement of Fat Mike -lead singer of the legendary band NOFX - as partner and proprietor. Now, we have the utmost respect for Fat Mike, and NOFX, and punk rock or whatever, but let's be honest - with the current demographic that would even remotely care about his involvement (dudes in their thirties who peaked at seventeen), that kind of billing only matters if you're selling $15 tickets to a Hudson River concert cruise. A restaurant in this part of Brooklyn is a whole different story, as evidenced by the fact that the experiment was seemingly unsuccessful. The ownership team has since brought in Dale Talde of Top Chef fame to right the ship, and Fat Mike's headline has been reduced to a tiny callout at the bottom of the website that reads something like: "Fat Mike was in a band, and here's his Wikipedia page." We never made it into the previous iteration of Thistle Hill Tavern, but have visited since Talde's involvement and can say that we like what we've seen so far. This is a classic neighborhood restaurant in every sense of the word, and it seems to fill a void in the area by being a simple and reliable standby for dinner and drinks and everything in between. One of the most telling things we noticed about Thistle Hill was the amount of people eating solo at the bar (more than two). That's a good indication that a restaurant is serving the neighborhood, and we can understand why people would want to come in here to eat a burger and read a book. The staff is nice, the food is good, and the drinks are too. The only words of caution that we would issue would be to say that just because a "Top Chef" is involved, don't think that this is some kind of dining destination. For instance, if you live in Tribeca, you probably don't need to spend forty minutes riding on various trains just to have a meal here. You'll quickly realize that you came all that way to eat at a 2013 version of Walker's - and that's a compliment to Thistle Hill. If you want the true Top Chef bus tour experience, hit up Talde, Catch, or the trash cans out in front of Padma's Lower East Side apartment building. That woman throws away some delicious things. So we've heard. Everybody has a kale salad these days, and this one has Corn Nuts in it. And they're probably artisan corn nuts. Either way, we like this. Yes, this is an "American" restaurant, but why does that mean they can't have some Korean sh*t on the menu? Would it be weird if they served nachos? Didn't think so, racist. We like these beef lettuce wraps with kimchi, and you will too. So this is delicious, and is also apparently a really good way to get your disgusting friend who never touches vegetables to eat something healthy. Like putting a dog's heartworm pills in peanut butter. There's some Italian stuff on this menu too, including this excellent ravioli, and a solid spaghetti and meatballs. Thistle Hill Tavern has a reputation for serving a solid burger, and after having it, we can see why. It's exactly what you'd expect a burger in a place like this to be - simple, delicious, and just the right amount of greasy. You should eat it. These fries are good too. Have some with the burger. Or without it. 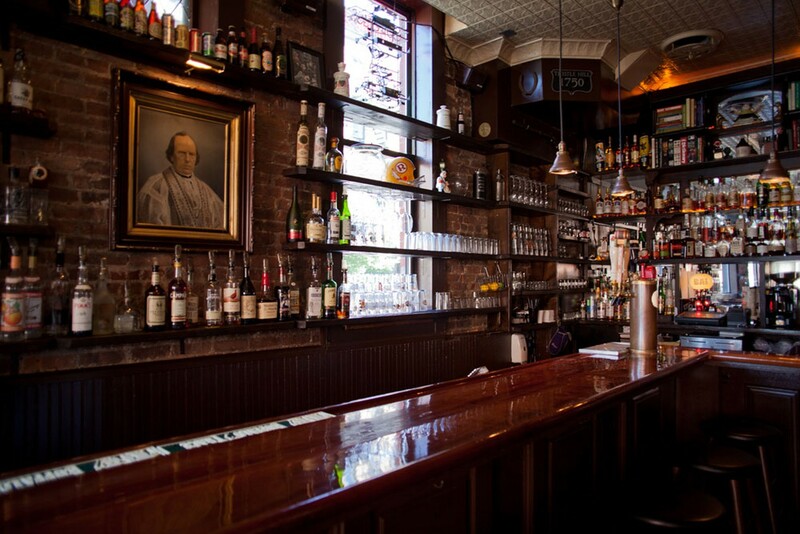 Part natural wine bar, part restaurant, The Four Horsemen is one of our favorite places to drink and eat in Brooklyn. Boulton & Watt is a solid neighborhood hang with average bar food and some TVs for sports viewing purposes. Adjust expectations accordingly.